Polythene Layflat Tubing - 5% Off Today - Free Delivery! Clear polythene Layflat Tubing is a continuous roll of tubing available in 3 weights - medium duty (220 gauge), heavy duty (440 gauge) and ultra heavy duty (1000 gauge). Also Heavy Duty tubing in Black, Red, Blue and White. 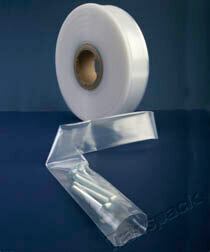 All food safe, heat sealable and recyclable. Bespoke layflat tubing can be made - please contact us with your requirements and we will be happy to quote. Watch our video about "Polythene Layflat Tubing" - use the full screen option to see in the best quality. 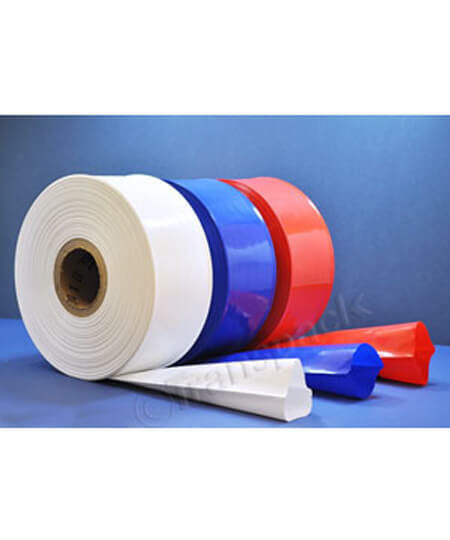 Polythene layflat tubing (usually referred to as just "layflat") is an endless and seamless tube of polythene in exactly the state in which it comes from the extrusion machine. Looked at simply it is a continuous polythene bag with no bottom! How can I secure the ends of my layflat? 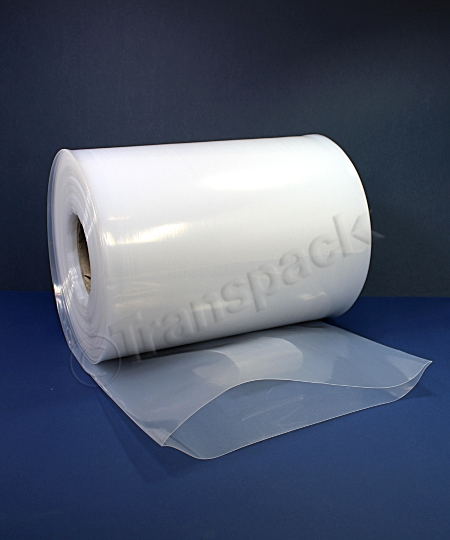 You can close layflat by all the same methods as any polythene bag. 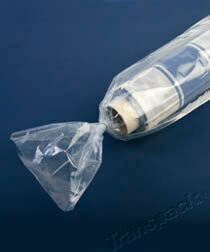 Most people tape the ends, some use a stapler and many heat-seal the ends. You can even tighten cable ties around the ends! If you are planning to make bags which will be filled for short periods they will be watertight, but after 24/48 hours you may see some leaking. You would also need to use heavy duty, or double welds. Can I freeze layflat wrapped round fish? Yes - polythene is temperature stable in a domestic freezer. It is not suitable in commercial freezers because the temperature is too low, and drops too quickly. It will cause the polythene to crack. For this purpose you will need the additive EVA which reduces stress fractures and is available on special order with a minimum order of 10 rolls. Can I use layflat as air-ducting? Yes - lots of people use layflat as cheap air-ducting; not only that, but wherever you want extra air simply make a hole in the duct! It can also be used to carry air-born products into silos, etc. What is the diameter of 12" (305mm) layflat? Our listed layflat dimensions are half the circumference (i.e.the circumference is twice the width when laid flat). This means that a 305mm wide tube does NOT fit a 305mm dia pipe. To go over a 305mm pipe the layflat circumference would need to be 305 x 3.142 (Diameter X pi) = 958mm This is twice what the laid flat width would be; so - halve it for the right width, in this case 479mm. The nearest available size is 508mm (20") - a nice fit with a little to spare. Can I make my own bags from layflat tubing? Yes, you’ll need a heat sealer with a cutter to make life easy. If you are packing components of varying lengths but a common width, layflat is the ideal solution. It saves stocking loads of different size bags. What duty should I use to pack a steel angle-iron? Rule out Medium duty immediately - it won’t be tough enough to hold the angle-iron. Heavy duty will be fine on your own vehicles with limited handling, but for despatch on outside carriers we recommend the ultra heavy. What duty should I use for packing curtains? For these the Medium duty will be sufficient, but not if you are shipping them by carriers. In that case use Heavy duty. How long are the rolls of layflat tubing? Except - very wide rolls are usually shorter in length & shown as such. 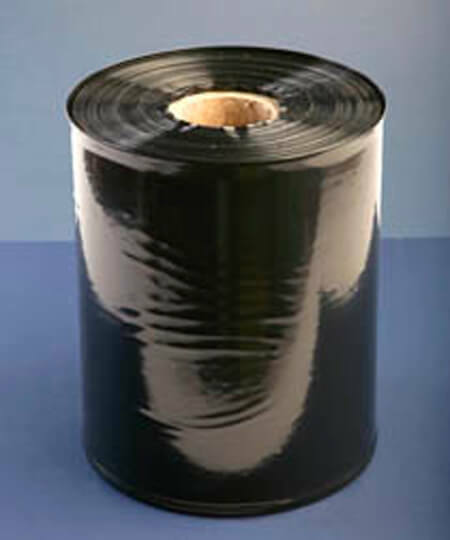 Layflat tubing is an endless and seamless tube of polythene in exactly the state it comes from the extrusion machine. I’m going to explain how we measure the tubing and how to choose the right size layflat for your needs. I’ll be using the example of 4” layflat but it comes in many different sizes. 4 inches is the width of the tubing when its laid out flat. In other words, it is half the circumference of the tube. This width is the measurement you will find on our website and in our catalogue. The diameter of the tubing (so the distance across the circular) is not therefore 4 inches and would not fit 4” diameter tubing inside. To fit over a pipe with a 4-inch diameter, the layflat circumference must be calculated. Let me show you how to do it. Take the diameter of your pipe – 4 inches, and multiply it by 3.142 (commonly known as Pi). This is the circumference of the tubing. And it comes to 12.568 inches. To get the layflat width you need to half this measurement. This comes to 6.284 inches. So, to fit a 4-inch diameter pipe inside layflat you will need layflat with a 6.248-inch width. The nearest size we stock is 7 inches. A nice fit, with a little space. Next comes the duty. Polythene layflat tubing comes in 3 duties. Medium duty, Heavy Duty and Ultra Heavy Duty. Here are two examples to help you decide on the duty you need. Firstly - which duty would you need to hold steel angle iron? For this the medium duty wouldn’t be heavy enough. Heavy duty would be fine with limited handling, but we’d recommend Ultra Heavy Duty if you are going to dispatch with an outside carrier. How about curtains? Medium duty would suffice to hold curtains but not for shipping by carriers. For that we’d recommend Heavy Duty. Order your layflat online or by telephone before 3pm and we aim to despatch your order the same working day. Orders over the value of £35 are delivered free of charge. For any other information call our customers service helpline on 02380869999 or visit our website and our friendly staff will be more than happy to help you.